"Visual Pharmacy Plus": Physician Practice "Dispensing Solutions"
Visual Pharmacy Plus™ Dispensing Physician Office Software is a fully integrated, real-time, prescription processing software. This software is designed for dispensing physician offices, such as, pain management centers, medical offices, group practices, private clinics, specialty diagnostic and rehabilitative services clinics. The system provides the dispensing physician the ability to manage inventory, accounting and compliance with state and Federal Laws. As a fully integrated facilities system, the software includes Med Sheets, Physician Order Forms, Order Processing, Single Dose, Cycle Filling, Facility Accounting and Clinical Reports. PATIENTS SAVE TIME & MONEY BY RECEIVING THEIR MEDICATIONS DIRECTLY FROM THEIR PHYSICIANS. 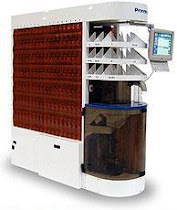 INCREASE INCOME BY DISPENSING MEDICATION DIRECTLY TO YOUR PATIENTS. IMPROVE TREATMENT COMPLIANCE, IN-OFFICE MEDICATION DISPENSING ENSURES YOUR PATIENTS HAVE THEIR MEDICATIONS IN HAND BEFORE LEAVING THE PHYSICIAN OFFICE. AbacusRx™ maintains an up-to-date database of more than 100,000 physicians nationwide, over 8,000 insurance companies, and 1,000’s of drugs. The access and maintenance of this data insures that your pharmacy stays ahead of the competition. Whether you fill 50 or 5,000 prescriptions a day, the AbacusRx Visual Pharmacy Plus™ suite of software handles it with ease.